MIS graduates work for a number of major organizations in the region, including State Farm, Eli Lilly, Caterpillar, Sallie Mae Corporation, IBM, ISU, Kimball International, Union Hospital and Hamilton Center, Accenture, Price-Waterhouse, Deloitte International, Clarian Health, Cummins, and many more. Alumni who wish to speak in classes, act as hosts for field trips/site visits, or participate in the MIS Corporate Advisory Board activities are urged to call the department office, 812-237-2086 or email business@indstate.edu for more information. Alumni with class projects are particularly desired; contact the professor in that area or contact the department office. If you graduated from the MIS program, please take a moment to complete the Alumni Information Form and let us know what you are doing. We want to hear from you! 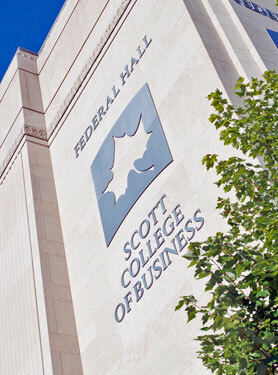 Keep in touch with what's happening with colleagues and friends within the College of Business. Update your mailing address or send personal and professional news items to us via this form.